I was lucky enough to have the chance to interview one of my favourite bloggers, Zoe Edwards. 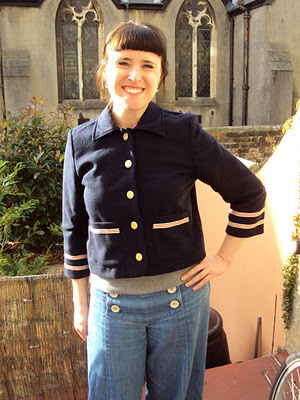 Zoe has been blogging about sewing at So, Zo… What do you know? for a few years, and currently works with TRAIDremade, the textile recycling branch of the charity TRAID. The online sewing community is brimming with talent. Whether you’re posting your projects on BurdaStyle or taking part in the vintage sewing movement on Sew Retro, the internet is full of sewing inspiration. I’ve been reading Zoe’s blog for some years now – she was a Brit living in Barcelona, at the same time as I was a language assistant in Germany. Her projects always blew me away, and I’d always pop back to So Zo… for a catchup on her sewing adventures. Yet Zoe’s blog isn’t just about sewing. At the heart of So Zo… is the challenge to live sustainably, free from fast fashion. It’s been about five years since Zoe discovered the Wardrobe Refashion pledge, a project she says changed her life. Anyone who has taken the Wardrobe Refashion pledge in the past or who have just started with the Seamless pledge will know how difficult it can be starting out! Living in Spain brought an extra challenge for Zoe, where charity shops are rarer and dearer. After challenging herself to go a month wearing nothing but clothes she had made herself, Zoe decided to throw open the challenge to her readers with Me-Made-May. 80 participants signed up to the first challenge, and 2010’s Self Stitched September (which I took part in!) attracted over 160 pledgers! The Me-Maders and Self-Stitchers kept an eye on each other’s progress through Flickr and Facebook, as well as posting daily outfit updates on their blogs. On top of this, you’ll often find some really thought provoking posts on So Zo… which really get to the heart of the problems with fast fashion. Now working for TRAIDremade, Zoe continues to fight the sustainable cause. Thankfully, making sewing her job hasn’t detracted from her enthusiasm for self-stitching! What began as a decision to avoid fast fashion has turned into a complete overhaul of shopping habits; Zoe’s said goodbye to buying new fabric and new shoes, and she’s always looking for ways to take her sustainable lifestyle to the next level. The Seamless Pledge is all about challenging yourself – my life would be so much easier if I could just pop into a clothes shop to buy myself a dress if I fancied it, but where’s the fun in making things easy for yourself? Whenever I worry about being able to pull this off, Zoe’s blog is one of the first places I click for inspiration and is one I think any Seamless pledger should add to their reading lists. Big thanks to Zoe for letting me interview her! As for you guys, what do you think? Has she inspired you to shake up your shopping habits? Thanks for the effort you’ve gone into making this post from the interview. It’s been a good opportunity to share my thoughts and feelings on these topics that matter so much to me. Plus, I’m very impressed with your audio editing capabilities!!! Wishing you all the best with the Seamless Pledge, I’ll link to it from my blog shortly. One thing, I think that last soundcloud clip is a repeat from an earlier one. Thanks Zoe, it was lovely to be able to interview you! Oops, that’ll be the evidence of the ‘mare I had with Audioboo and Soundcloud! Should be sorted now, thanks so much for flagging it up! Very cool post, I’ve never seen (heard? haha) an interveiw like this and I love Zoe’s blog too. 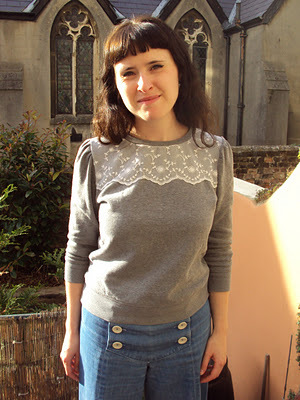 I really should take your pledge, but I love sweaters too much and I can’t knit so I think thats holding me back a bit. I’m always afraid the knit items at thift shops will be stretched beyond repair or something. Great interview, thanks for posting it! I’ve decided to avoid buying clothes, but I got there by a different route – the primary reason is that most stuff just doesn’t fit. Going shopping is an exercise in frustration for me, so I’m trying to improve my sewing skills. (Added bonus – a trip to the mall can revive my enthusiasm for DIY!) I also mend habitually in order to squeeze the most use out of everything I have; if it’s damaged I stop wearing it, so to get an item (back) into the wardrobe, it’s a lot more efficient to spend 30 min mending rather than hours shopping or sewing. I loved this! It took me a bit to sit down and listen but how lovely to hear Zoe’s voice. I started blogging shortly after finding her blog and it’s influenced me immensely, I’m leaning — more and more — to less overall. What I particularly loved: learning to re-fall in love with your garments. Yes!